NEVADA CITY, Calif. January 21, 2019 – Burn piles are a popular and cost-effective way of disposing of brush and tree limbs. Alternatives like chipping, composting, and green waste disposal are not always practical or available. As a reminder, burning is always prohibited in the city limits of Grass Valley and Nevada City. A burn permit from the fire department is always required in Truckee. Check with your Home Owners Association if burn piles are permitted in your neighborhood. Burn season in Nevada County is divided into three segments: Open burning – no burn permits required, burn permits required – in late Spring and late Fall after peak fire season is over and no burn season aka peak fire season. CAL FIRE suspends residential burn permits during fire season due to the increased fire danger. Even during open burning or burn permit-only season, no burn days may be called by the local air district or CAL FIRE. It is imperative to check the burn day status before lighting your piles. You can check the burn day status online at the Northern Sierra Air Quality Management District (NSAQMD) or via phone: Western Nevada County: (530) 274-7928 and Eastern Nevada County: (530) 582-1027. No burn days based on smoke dispersion and trapping of pollutants are determined by the air district. Ridges of high pressure create temperature inversions where the air is warmer a few hundred feet or more above the ground than at ground level. This traps smoke and leads to poor or no smoke dispersion. For residential burn piles, a burn permit issued by a fire department is required for parts of the year. You can obtain these free permits from most fire departments in Nevada County. Read the instructions on the burn permit and follow them – if the burn pile escapes you may be liable for suppression cost and/or a fine. In Nevada County, burn barrels are prohibited. Your burn pile cannot exceed 4 ft. by 4 ft. when residential burn permits are required. Clear all flammable materials and vegetation within 10-ft around your burn pile. Scrape the area down to bare soil. Keep a water supply close by, like a garden hose or a portable water tank. Have a shovel ready as well. Never leave a burn pile unattended – meaning an adult has to be present. 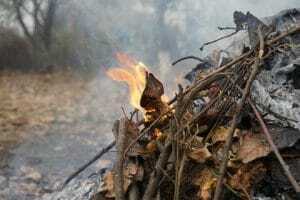 Your burn pile cannot contain mainly leaves and pine needles. Burn only natural vegetation, no garbage, painted or treated wood, plastic, paper, construction debris etc. Let your neighbors know when you will be burning. Anyone with respiratory ailments or sensitive to smoke will especially appreciate the heads up. For the best smoke dispersion, burn between 9:00 am and 3:00 pm. Pile branches and brush loosely for better combustion. Check that there are no overhanging branches above your pile. Cover your burn pile(s) until it is a permissible burn day and you are ready to light the pile. Burning hot and clean minimizes smoke. Construct piles loosely, with spaces to allow adequate oxygen to reach the burning material. Construct piles intelligently, in a dome or teepee shape that allows heat to build so that flames can be maintained and the vegetation can be consumed rapidly. Flat, sprawling piles rarely burn well. Create a “heart” of fine, flammable vegetation such as dry scotch broom and light it down low on the side the wind is coming from. Check berry vines for excessive moisture by breaking a thick cane and squeezing the pith — many people have accidentally offended their neighbors by burning wet berry vines that were dry on the outside. Make sure your pile is clean (another regulatory requirement); an archenemy of a good burn pile is dirt, which concentrates as the vegetation burns away, reducing airflow. If you have a large pile or multiple piles, light a small test fire first, to make sure the smoke goes up and away from neighbors. Try to burn when a storm is approaching (and the air pressure is dropping); smoke dispersion is usually pretty good then. In general, low air pressure equates to better smoke dispersion. Observe wood stove smoke in your area to get an idea of how your smoke is likely to behave. Use a hat (as a fan), leaf blower or tractor fan to force air into the pile as needed. Wear gloves and keep tools on hand to manipulate branches and fluff the pile up as needed, and turn protruding, smoking branches in to the flames (you can shield the heat from your face with a shovel or a leather hat if necessary, and don’t wear loose, flammable clothing such as an unbuttoned overshirt). Arrange slightly damp leaves and brush around the active pile to dry them before adding them to the pile. Don’t burn all the small branches first. Pace the addition of small stuff to maintain flames as needed. Likewise, be aware of how well various plants burn — manzanita, buckbrush and broom can be gradually added to keep less flammable plants such as hardwoods and ornamentals burning well. English laurel is especially notorious for burning poorly and creating irritating smoke. Stay with your pile and make sure it burns hot and clean. When it has burned down to coals, put it out with water if possible instead of letting it smolder all night (extinguished coals can be good for a garden). If your fire is not going well, or smoke is blowing toward a neighbor’s house, it is perfectly honorable and neighborly to put it out and wait for another day. Never burn household garbage or cardboard. Plastics, foam and the colored ink on magazines, boxes, and wrappers produce harmful chemicals when burned. They may also damage your wood-burning appliance. Never burn coated, painted, or pressure-treated wood because it releases toxic chemicals when burned. Never burn ocean driftwood, plywood, particle board, or any wood with glue on or in it. They all release toxic chemicals when burned. Do not attempt to burn large stumps in a residential area, and avoid burning punky logs that are well on their way to enriching the soil. If it’s too windy or too wet at your location, even if it’s a permissible burn day, postpone burning until conditions improve. Any prescribed burn, or broadcast burn, requires an air pollution permit from NSAQMD. This includes land clearing for building, forest management, agricultural burns, range or grazing burns, ditch or roadside burns and hazardous fuel reduction. Contact the NSAQMD for details on the necessary forms and fees. This concludes Week 7 of 25, next Monday we’ll provide you with details for your Family Emergency Plan.